Brigade At No. 7 is a residential project developed by Brigade Group. The project offers very well designed 2.5BHK, 3BHK, 3.5BHK and 4BHK apartments with various amenities. Where is Brigade At No 7 located? The project is located in Banjara hills, Hyderabad. What are sizes of apartments in Brigade At No 7? The apartment sizes in the project range from 3347.0 sqft to 5180.0 sqft. What is the area of 2 bhk in Brigade At No 7? The size of a 2BHK unit in the project is 3510.0 sqft. What is size of 3 bhk in Brigade At No 7? 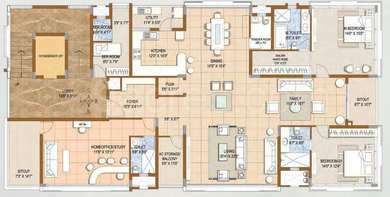 The area of 3 BHK apartments is 3510.0 sqft. What is total area of 4 bhk in Brigade At No 7? 4 BHK units in the project are available in a size of 3347.0 sqft to 5180.0 sqft. What is the area of Brigade At No 7?The total area that the project occupies is 3.0 Acres. Founded in 1986 with a focus on real estate development, Brigade Group is now among the leading property developers of South India. Headquartered in Bangalore, it also has branch offices in south Indian cities and Dubai. Though the wide-ranging portfolio entails diverse realms like education and hospitality, its core area still remains property development and property management services. Its projects are spread across cities like Chennai, Hyderabad, Chikmagalur, Kochi, Mysore and Mangalore. IS THIS PROJECT HAS HOME AUTOMATION AS ONE OF THE AMENITIES.